As you may have gathered from my utter lack of posts on the subject, I'm not a huge fan of Valentine's Day. I just think that when you love someone you need to show them that, in ways big and small, every day -- not just on some manufactured Hallmark holiday. So, sorry -- no hearts and butterflies from me. But I do adore these caustic yet caring cards, $3 each or $15 for a set of ten from Etsy seller Tina Seamonster. For when you care enough to, you know, spare your one and only from the coming undead apocalypse. 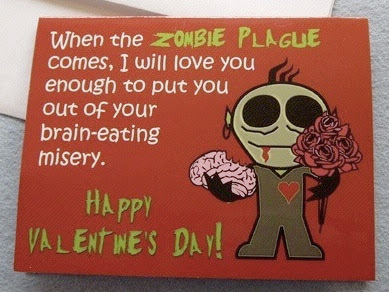 "I Love you more than Zombies Love Brains"
He was just as smitten as I was.. that must mean something! it's not about the special days, it's about the everydays..